A rich, moist, classic, and completely from-scratch chocolate cake! Today I’ll be showing you how to make the BEST Chocolate Cake you’ve ever had. 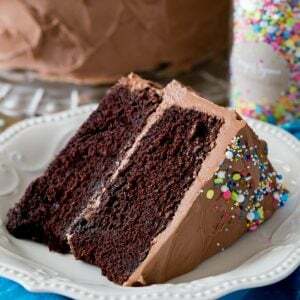 So simple to make, fudgy, richly chocolaty, and topped off with a silky chocolate frosting, this is the chocolate cake recipe that you’re going to want to print and save. Be sure to scroll to the bottom of the recipe to see my video showing you how I make this chocolate cake in my own kitchen! Welcome to our fifth Recipe of the Month: The BEST Chocolate Cake! 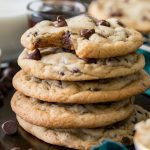 In case you missed it, each month I’m selecting a different recipe that I’d love for you to bake along with me! And, if you participate, you’ll be entered to win prizes like a $50 Amazon Gift Card, so make sure to check out all of the details that I shared yesterday on how to participate. For the month of September we are making this timeless Chocolate Cake Recipe. This chocolate cake is actually not new to the blog. 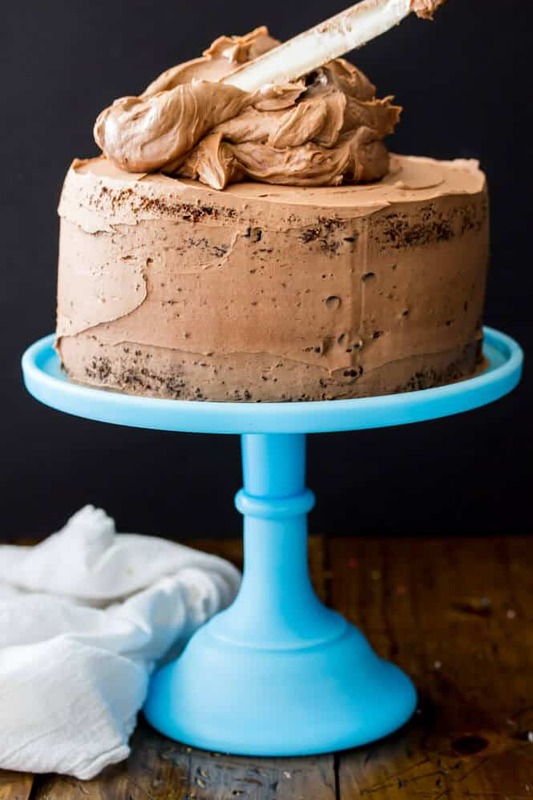 I originally published it early last year after a ton of trial and error — in fact it took me almost 5 months to perfect this chocolate cake recipe. 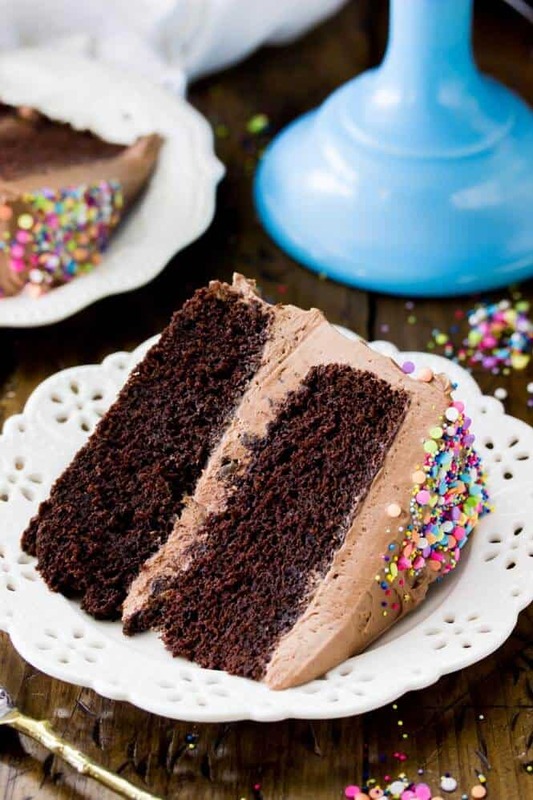 I frosted this cake with my favorite chocolate frosting and I recommend you do the same (it’s so good! 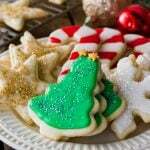 ), but for those of you participating in the recipe challenge you do not have to use this recipe, feel free to use your own favorite frosting and I listed several other options in the recipe notes. Now let’s get into all the tips and tricks that I promised you yesterday for making this chocolate cake the best one you’ve ever tasted. 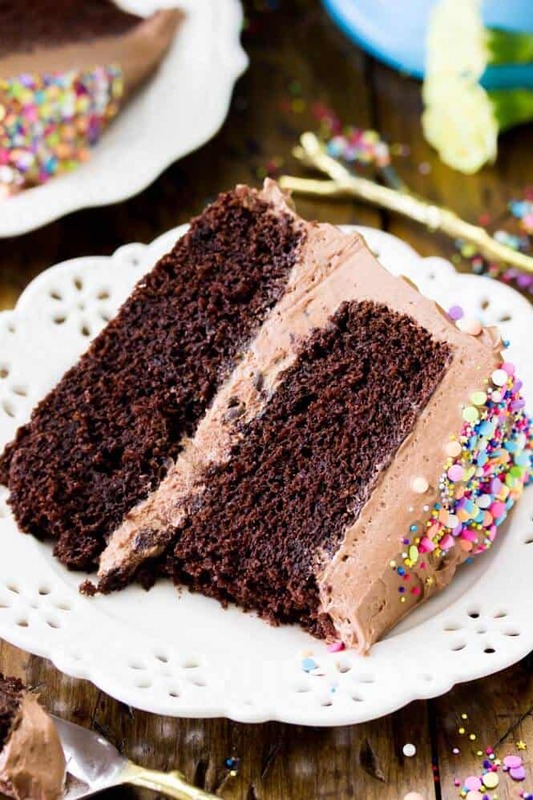 Each ingredient in this chocolate cake recipe was carefully chosen to make for a moist chocolate cake. I use buttermilk for this very reason, it not only gives the cake a great flavor but it also keeps it soft and moist. 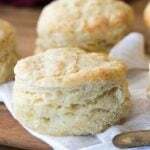 If you don’t have buttermilk on hand, you can use my easy buttermilk substitute instead (all you’ll need is “regular” milk and either lemon juice or vinegar). I also use both butter and oil for a cake that has a great flavor but is still nice and moist (don’t substitute the oil for butter or your cake will come out dry, don’t substitute the butter for oil or you’ll lose some of that great butter flavor!). The extra egg yolk in this recipe also makes this chocolate cake moist. Another way to keep this chocolate cake moist is to take care that you do not over-bake it. 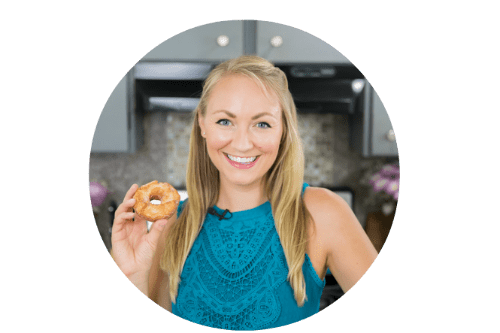 Make sure that your oven temperature isn’t running hotter than it is leading you to believe (I keep two thermometers in my oven to make sure the temperature is accurate), as an oven that’s too hot will over-bake your cake in your hurry and it will come out dry and crumbly. Also, when checking to see that my cake is finished baking, I do the “toothpick test” but I look for the toothpick to come out with a few moist crumbs (not with wet batter, they should distinctly be crumbs) and not to come out completely clean. The cake will continue to bake in its pans while it’s cooling, so if the toothpick comes out completely clean then you run the risk of the cake over-baking and drying out while it’s cooling. 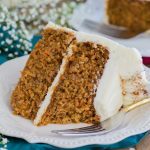 A crumb coating is always a good idea — apply a thin, even layer of frosting to catch all of your crumbs and then place the cake in the freezer for 15 minutes. 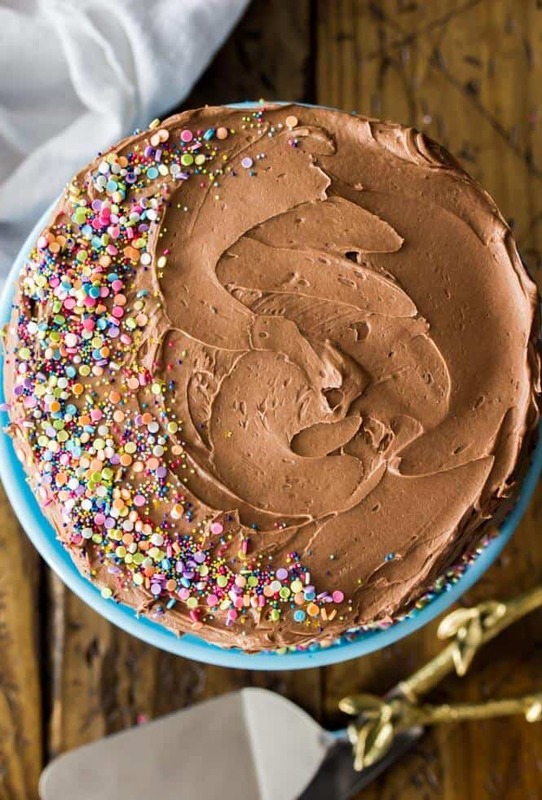 Remove and frost completely for a crumb-free frosting! Do I have to use Coffee in My Chocolate Cake? No, actually you can use hot water instead. However, it is important that you use hot liquid, whether coffee or water. The reason for this is that the hot water will “bloom” your cocoa powder, fully developing the chocolate flavor in this cake. Now here’s why I recommend using coffee — it won’t make your cake taste like coffee but it will enhance the chocolate flavor. Since I’m not actually a coffee drinker I keep a jar of instant coffee in my house specifically for this chocolate cake recipe — I just dissolve a teaspoon of instant coffee into hot water before adding it to my batter. You can, but I’ve found that this chocolate cake recipe is so moist that the cupcakes just fall apart, and you really need a fork to eat them. Because of this, if you’re looking for a good chocolate cupcake recipe I really recommend trying my easy chocolate cupcake recipe instead. Can I Freeze This Chocolate Cake? Yes, you can freeze the layers (after they’ve cooled completely) by wrapping them very well with plastic wrap and then freezing. 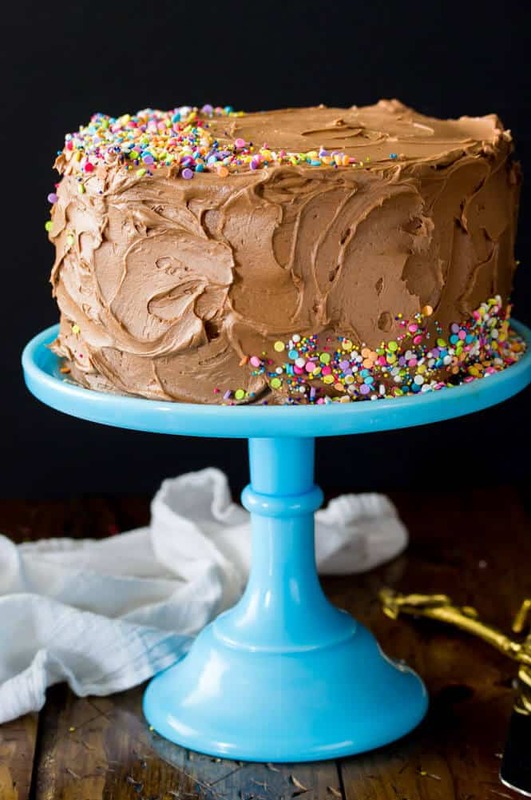 The cake may also be frozen after it’s frosted, to do this I would place your cake in the freezer for about 10-15 minutes or until the frosting is firm, remove it and wrap very well and then return to the freezer. This cake may be frozen for up to a month. 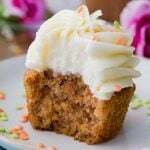 Other Cake Recipes You May Enjoy: Vanilla Cake, Marble Cake, Carrot Cake, White Cake. 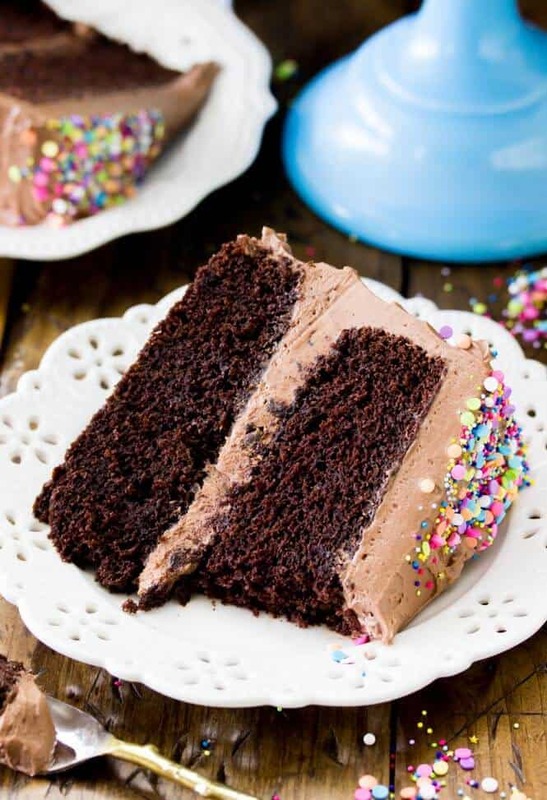 This is the BEST Chocolate Cake Recipe! Fudgy, chocolatey, moist, and made completely from scratch! 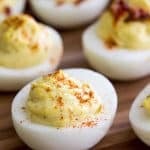 Be sure to check out the VIDEO at the bottom of the recipe! Preheat oven to 350F (175C) and prepare two deep 8" round cake pans**** by lining the bottoms with parchment paper and lightly greasing and flouring the sides. Set aside. 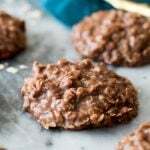 In the bowl of a stand mixer fitted with a paddle attachment, whisk together flour, sugars, cocoa powder, baking soda, and salt. Add melted butter and oil, stir well. Add eggs and egg yolk, one at a time, stirring well after each addition. Pause occasionally to scrape down sides and bottom of bowl. Stir in vanilla extract. Gradually add buttermilk and stir well. Add hot coffee, stirring until ingredients are well-combined (be sure to scrape sides and bottom of bowl again). Evenly divide batter between prepared pans. Bake on 350F (175C) for 35-40 minutes (toothpick inserted in center should come out with moist crumbs). Allow to cool for 15 minutes before inverting onto cooling rack to cool completely before frosting. Gradually add heavy cream, increase speed to high and beat for 1 minute. 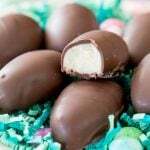 Spread a thick layer of frosting over the top of one cake round and sprinkle with mini chocolate chips. Top with second cake round and evenly frost cake. Slice and serve. 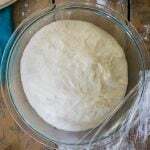 *If you don't have buttermilk on hand, please see my post on making an easy buttermilk substitute! **You can substitute with hot water if you don't have coffee, but do make sure it is hot! See the post for more information on why I use coffee and why it is important that the liquid be hot. ****You can use 9" pans instead, but the cakes will need to bake for less time. I'd start checking the cakes at 27/30 minutes. Please keep in mind that if your pans are dark-colored the cake may also need less time to bake. Hi! 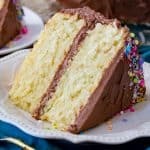 I want to try to use this recipe for the top layer of a 2 tier cake for my son’s birthday. Would it hold up to stacking and fondant? Hi Sarah! I think this cake will hold up just fine. I hope you love it! 🙂 Let me know how it goes.